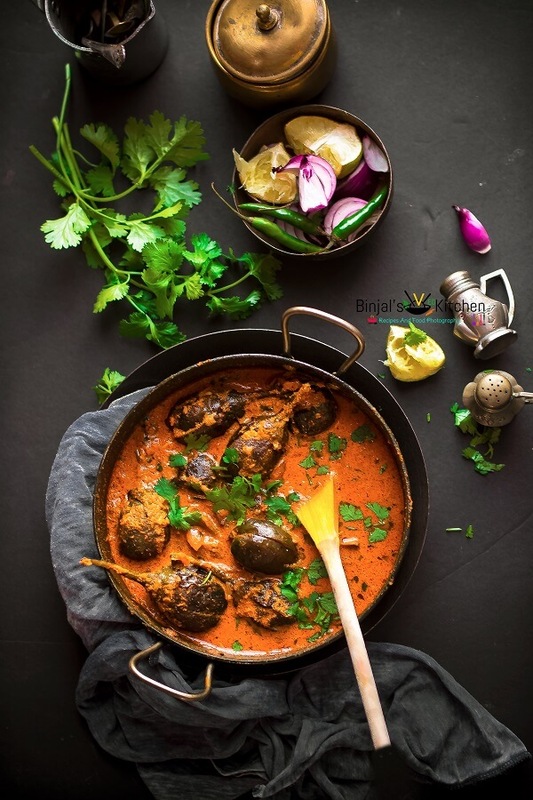 Hyderabadi Bagara Baingan or Baby Eggplant Curry, This spicy Hyderabadi Bagara Baingan is a popular curry of Hyderabad, Telangana. Hyderabadi Bagara Baingan accompanies Hyderabadi biryani or roti. Its key ingredient is baby eggplants which cooked with spices like sesame seeds, coconut, cumin seeds, ginger, garlic paste, turmeric powder, bay leaf and tamarind pulp. We can also add peanut for grainy texture to this dish. Hyderabadi Bagara Baingan is belonging to Hyderabad cuisine, so also called Deccani cuisine. It is the native cooking style of the Hyderabadi Muslims, and began to develop after the foundation of the Bahmani Sultanate, and more drastically with the Qutb shahi dynasty around the city of Hyderabad, promoting the native cuisine along with their own. Hyderabadi cuisine had become a princely legacy of the Nizams of Hyderabad State, as it began to further develop further on from there. It is an amalgamation of Mughal, Turkish, and Arabic along with the influence of the native Telugu and Marathwada cuisines. Bagar means, tempering the oil with spices and baingan is baby eggplant or brinjal. Basically in Hyderabadi Bagara Baingan, we are tempering oil with spices and mix it with baby eggplant. Traditionally baby eggplants is deep fried in the oil. But I just shallow fried the baby eggplants with less oil. The gravy is made from roasted sesame seeds and peanuts with grated coconut. Okay then lets learn how to make this easy-pesy delicious curry! 1. Wash the baby eggplants and give a slit cut cross way on the top of it, left the stem as it is. 2. Heat 2 tbsp of oil in a kadai and deep shallow fry the baby eggplants until it tenders and soft. Once done remove it and Keep aside. 3. Dry roast peanuts and sesame seeds separately in another kadai for few minutes. 4. In a mixer or blender add the roasted items along with grated coconut and make a fine paste of it by adding water. 5. In the same kadai (which is used for frying baby eggplants) heat the 1 tbsp oil, and then add mustard seeds, cumin seeds, Bay leave and pinch of hing. Add finely chopped onions and fry until it turns into transparent. 6. Add ginger garlic paste and mix well. Add grounded paste, red chili powder, coriander and turmeric powder, then stir fry it. Add 1/4 cup of water in the mixture and allow to boil. 7. Add tamarind pulp and salt, mix well then add fried baby eggplants. Mix it well with the masala and cover with the lid. 8. Allow to cook 7-8 mins on a medium flame, slowly it will form a thick gravy, turn off the stove and garnish it with fresh chopped coriander leaves. 9. Hyderabadi Bagara Baingan is ready now. Serve it hot with biryani, rice or roti and enjoy your meal. • I used readymade tamarind pulp. However, if you would like then you could make it at home using lemon sized tamarind ball soak it into the warm water for 30 mins, and then strain the soaked mixture pressing thru the strainer. • You can remove the baby eggplants stems if you don’t like it. • You can deep fry the baby eggplants too or shallow fry it. Wash the baby eggplants and give a slit cut cross way on the top of it, left the stem as it is. Heat 2 tbsp of oil in a kadai and deep shallow fry the baby eggplants until it tenders and soft. Once done remove it and Keep aside. Dry roast peanuts and sesame seeds separately in another kadai for few minutes. In a mixer or blender add the roasted items along with grated coconut and make a fine paste of it by adding water. In the same kadai (which is used for frying baby eggplants) heat the 1 tbsp oil, and then add mustard seeds, cumin seeds, Bay leave and pinch of hing. Add finely chopped onions and fry until it turns into transparent. Add ginger garlic paste and mix well. Add grounded paste, red chili powder, coriander and turmeric powder, then stir fry it. Add ¼ cup of water in the mixture and allow to boil. Add tamarind pulp and salt, mix well then add fried baby eggplants. Mix it well with the masala and cover with the lid. Allow to cook 7-8 mins on a medium flame, slowly it will form a thick gravy, turn off the stove and garnish it with fresh chopped coriander leaves. Hyderabadi Bagara Baingan is ready now. Serve it hot with biryani, rice or roti and enjoy your meal. Wowww Binjal! Love that steam! The curry looks too good! yum!